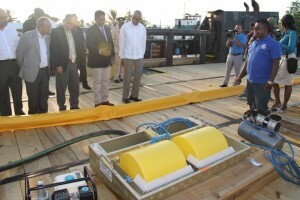 President David Granger (right) listens to GAICO’s CEO, Komak Singh (second from right) explain how the oil spill clean up mechanism works aboard the MS Maleka. from carrying fuels in Guyana. 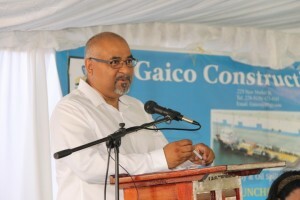 Chief Executive Officer of GAICO Construction and General Services, Komal Singh called for efforts to be made to reduce that type of risk at the commissioning of an oil spill clean-up vessel at Nismes, West Bank Demerara. He said currently, there is a lot of “near misses in Guyana when it comes to spills” with one of the greatest risks being single hull tankers developing a leak if it strikes wreckage in Guyana’s waters. “We need O=to prepare ourselves for it and we need to ensure that we have legislation in place, we need to enforce that legislation so that over a period of time we will have all those single-hull min tankers traversing our waters upgraded to double hull tankers,” he said. 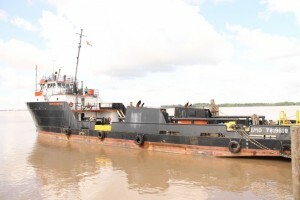 He said if a single hull mini tanker runs aground or hits wreckage, there could be a major spill that could shut down an entire port and pollute Guyana’s rivers and coastline. Singh said his company has also teamed up with a United States-based company, Yellow Fin, to provide additional equipment and expertise if there is a huge oil spill in Guyana’s waters that GAICO could not handle on its own. Director General of the Maritime Administration (MARAD), Claudette Rogers confirmed that Singh’s concerns are real and she acknowledged the need for legislation and enforcement. “We do have single hull (vessels). We don’t yet have legislation in place which speaks adequately to double hull,” he said. She said the international oil tankers that bring fuel to Guyana are double hulled in keeping with international rules. Rogers could not immediately say when the appropriate legislation would be enacted but assured that attention would be given to it. GAICO has so far invested more than US$500,000 in a supply vessel that could be used to transport supplies to vessels offshore and also fitted with booms, skim kits, work boats and storage tanks to cleanup oil spills. Singh said the company was preparing to apply for permission to build a soil remediation facility to clean up spilled oils and use them to fuel GAICO’s asphalt plants or operating heating facilities. “With oil and gas also, they have all these different types of contaminant material that needs to be processed; currently they are processed through foreign companies,” he added. Oil and Gas Professor, Suresh Narine. Oil and Gas Professor, Suresh Narine noted that “the impact of dealing with oil and gas can be devastating” and hailed GAICO for taking the lead on being prepared for the “very real chance of oil spills” instead of waiting on American and Trinidadian companies. The American oil giant, ExxonMobil, is preparing to begin oil production offshore Guyana by 2020. Narine urged Guyanese to ensure that they take advantage of opportunities to be trained in oil and gas station, while at the same time avoiding dependency on the fossil fuel dependency. He welcomed government’s policy decision to focus on sustainable development and economic diversification. 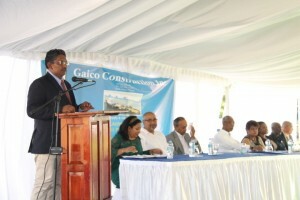 GAICO began in 1993 as a sole trading entity building bridges mainly in Region Three.